by Amy Payne, Heritage Foundation: Congress rammed Obamacare through without many Members even reading the bill. Now it’s applying that same frantic, complex, pie-in-the-sky legislating to immigration. The similarities are frightening. 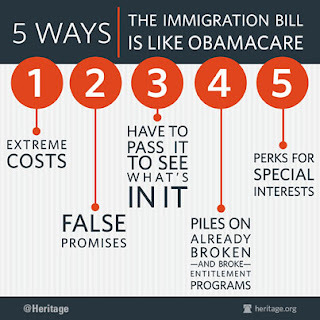 The Gang of Eight’s immigration plan granting amnesty to those unlawfully in the U.S. will cost already burdened American taxpayers more than they can bear. When he last crunched the numbers during the 2007 amnesty debate, Heritage’s Robert Rector calculated that a general amnesty would cost some $2.5 trillion—after considering what legalized immigrants would likely pay in taxes and receive in government benefits and services. His updated research on the latest proposal, due out soon, is likely to find a higher price tag in 2013. Remember President Obama’s promise that “If you like your health care plan, you can keep it”? That’s just one of the most famous (or infamous) broken promises of Obamacare. The Congressional Budget Office projects 7 million people will lose their employer-sponsored coverage by 2022 because of the law. On immigration, Heritage President Jim DeMint told CNBC’s Larry Kudlow this week: “I’ve heard a lot of promises about bills that have gone through Congress. …The only thing that I know about this bill is that it’s going to give legal status and eventual citizenship to those who came here unlawfully. The rest are just promises.” One of those promises is border security—as Heritage’s James Jay Carafano explains, the bill would not actually secure the border. Nancy Pelosi wasn’t kidding when she said Congress would have to pass Obamacare “to see what’s in it.” That’s because the bill gave federal agencies free rein to write regulations that would become the real-world version of the law—and even though it passed in 2010, the regulations are still being written today. The immigration bill does the same thing—it gives over congressional authority to federal agencies, allowing unelected bureaucrats to think up all the details later. Obamacare plans to add millions of people to the Medicaid rolls — the largest expansion ever to this problematic program, which is already unsustainable and needs vital reforms. Whenever the legislative process turns fast and furious, Members of Congress start loading on special-interest deals that are less likely to be noticed in the chaos. Obamacare was full of favors for Big Labor. Now, the immigration bill is carrying all sorts of special-interest goodies — not to mention a bonanza for immigration lawyers. This isn’t the way Congress should make laws. It’s only making the same mistakes all over again—and we’ll be paying for them. Tags: amnesty, border security, broken promises, budget, costs, debt, deficit, Entitlements, Taxes & Spending, Health Care, immigrants, immigration, Obama administration, Obamacare, social security, special interests, Taxes & Spending, taxpayers, Heritage Foundation, Morning Bell To share or post to your site, click on "Post Link". Please mention / link to the ARRA News Service. Thanks! Stop it from passing now!